Moore Square with Skyhouse Raleigh under construction in view. 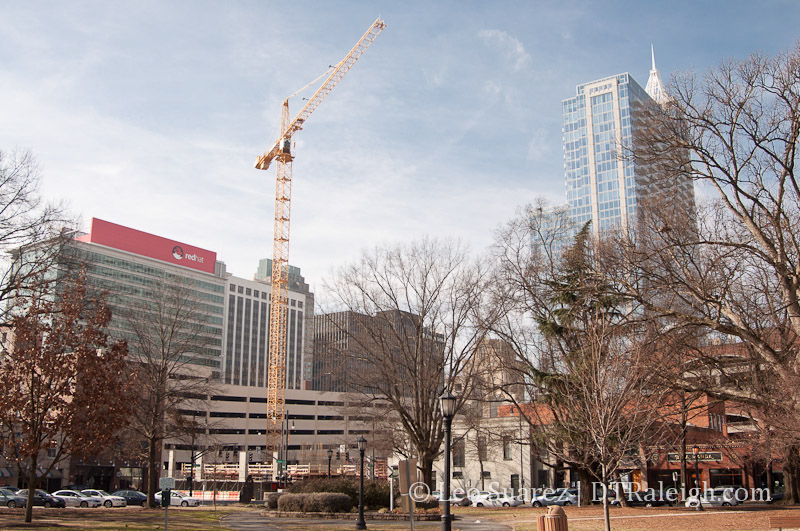 The next downtown Raleigh plan is in the works and here’s your chance to participate. Next week is the kickoff event for a process that may take most of the year. Public comments on ideas and suggestions are needed to shape what downtown Raleigh strives to be over the next ten years. Date/Time: Tues., Feb. 11 from 6 p.m. to 8 p.m.
You can see a lot more information about this on the city’s website. I’ll of course be following any released materials throughout the year and put them up on the blog for discussion. Dwight, The Residence Inn lot sale was approved at last week’s council meeting. Charter Square: I’ve heard that tenants have the option to back out if construction wasn’t started by 2-1-14. So that would seem like a pretty big deadline to start for the developer. Although, they could just put one guy on site cleaning up as “preparation” and that might qualify as ‘construction’ starting. Thanks Mike for the information. I have a good friend with the city that told me this morning that there were a few issues that had to be worked out. He didn’t say what they were.